It was David's Harp that helped soothe Saul's brooding sickness. 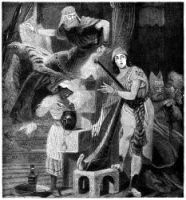 The king's servants, seeking by every means to help their master, whom they still loved, found that music calmed his melancholy fits as nothing else could. 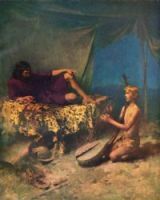 David was already known as a singer and player upon the harp. Saul sent word to Jesse, David's father, bidding him send the boy to the king's court. So David came, bearing a simple present to the monarch, and there, the sound of David's harp soothed Saul's troubled soul. The king owed gratitude to Dave, for David's music left him feeling refreshed and well, and the evil spirit departed from him. These pictures of David's Harp are from my collection of antique books. Feel free to use these illustrations of David's Harp in your artwork. 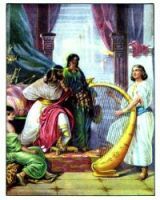 Click on the David's Harp drawings below to see more details about saving a free David's Harp image or about purchasing the images of David's Harp at a higher resolution.